Includes mouth-watering recipes! Curl up with Rosie, her friends and her family as they prepare for a very special Christmas . . . Rosie Hopkins is looking forward to Christmas in the little Derbyshire village of Lipton, buried under a thick blanket of snow. Her sweetshop is festooned with striped candy canes, large tempting piles of Turkish Delight, crinkling selection boxes and happy, sticky children. She's going to be spending it with her boyfriend, Stephen, and her family, flying in from Australia. She can't wait. But when a tragedy strikes at the heart of their little community, all of Rosie's plans for the future seem to be blown apart. Can she build a life in Lipton? And is what's best for the sweetshop also what's best for Rosie? 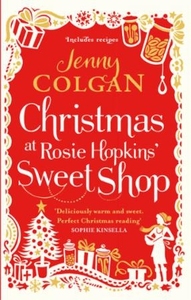 Treat yourself and your sweet-toothed friends to Jenny Colgan's heart-warming new novel. The irresistibly delicious recipes are guaranteed to get you into the festive spirit and will warm up your Christmas celebrations.